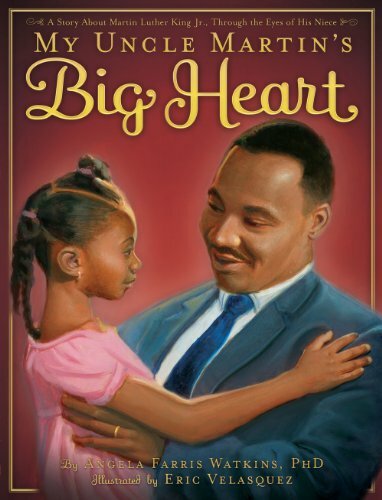 My Uncle Martin’s Big Heart is a heartwarming true story told from the perspective of the author when she was a young girl. To the world, Reverend Martin Luther King Jr. was an American hero and a pioneering civil rights leader, but to little Angela and her cousins he was imply Uncle M.L., the family man who loved to spend time with his wife Coretta and their four children. For some of us it may be difficult to see Martin Luther King Jr. as a simple family man because of his incredible presence, his history-making speeches, and the vital role he played in the civil rights movement, but even while showing her Uncle M.L. in a more simplistic light, she illustrates just what an amazing man he was. Angela Farris WatkinsEric VelasquezMartin Luther King Jr.